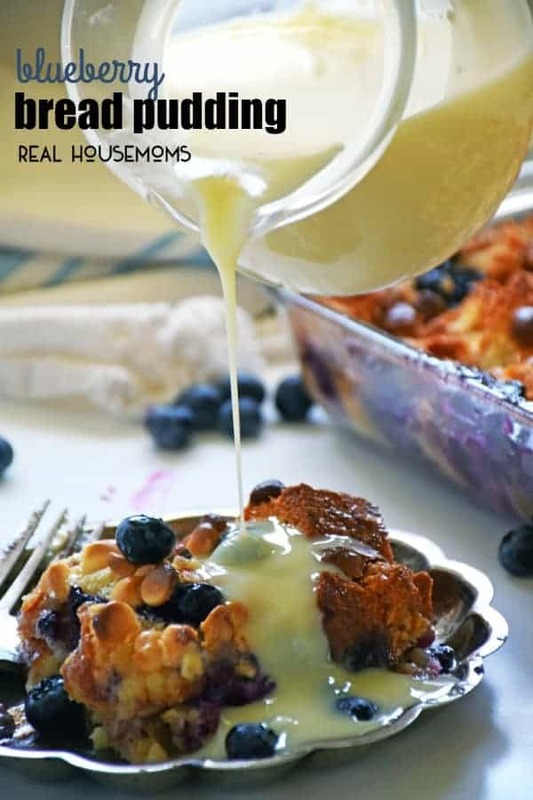 BLUEBERRY BREAD PUDDING is a sweet Southern treat drizzled with an amazing white chocolate sauce. Enjoy this easy recipe for a sweet breakfast treat or a special dessert! Bread pudding is a popular dessert that has been around a long time. If you do a Google search for bread pudding, you are likely to find many variations as it is so versatile. It’s also very easy to make and can be made ahead of time and reheated for serving. Dessert doesn’t get much better than that! Blueberries have been so tasty this year, so be sure to pick up some fresh ones before they are gone and make this recipe. Your family will praise you up and down as they stuff forkfuls of this delicious dessert into their mouths! 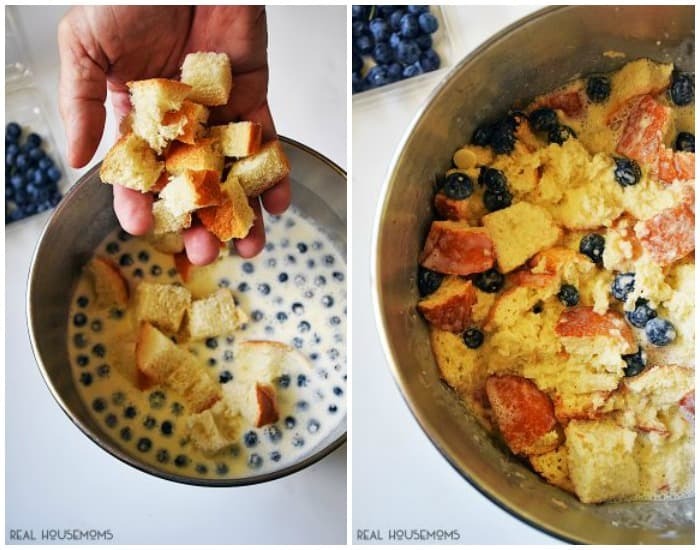 If you can’t find fresh blueberries, don’t let that stop you from making this recipe, you can certainly substitute frozen with good results. Preheat oven to 350°. In a large bowl, combine 3 eggs, beaten with 4 cups cream, 1 cup sugar, and 1 tablespoon vanilla. Stir to combine. 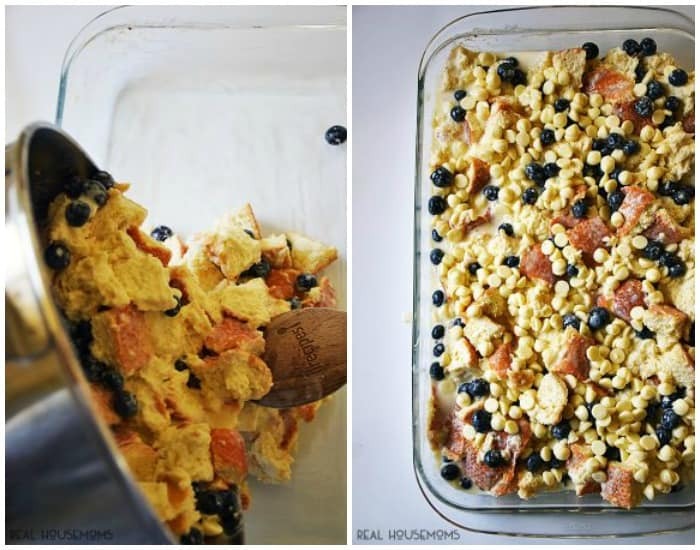 Add 2 cups blueberries and 10-12 ounces white chocolate chips. Stir in bread cubes and let stand for 15 minutes or until bread is softened. Transfer to a greased 13×9 inch baking dish and bake, uncovered, for 60-70 minutes or until a knife inserted near the center comes out clean. Let rest 5 minutes before serving. While the bread pudding is resting, make the white chocolate sauce: Heat 3/4 cup whole milk in a microwave safe dish (I use a glass measuring cup) until almost boiling. Place the white chocolate chips into a heat-safe bowl and pour the hot milk over them and whisk until smooth. 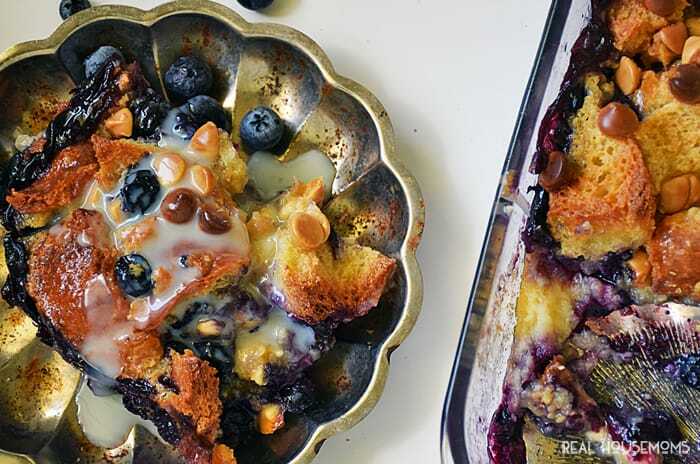 Serve with warm Blueberry Bread Pudding and enjoy! Blueberry Bread Pudding is a sweet Southern treat bursting with fresh blueberries and drizzled with an amazing white chocolate sauce. This easy recipe is perfect to take to a pot luck too. Preheat oven to 350°. In a large bowl, combine 3 eggs, 4 cups cream, 1 cup sugar, and 1 tablespoon vanilla. Stir to combine. 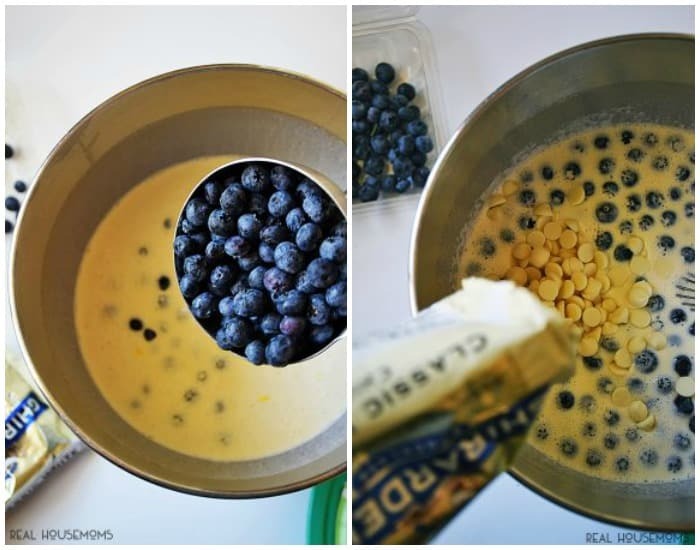 Add 2 cups blueberries and 10-12 ounces white chocolate chips. Stir in bread cubes; let stand 15 minutes or until bread is softened. Transfer to a greased 13 x 9-in. baking dish. Bake, uncovered, 60-70 minutes or until a knife inserted near the center comes out clean. Let stand 5 minutes before serving. For the sauce: Heat 3/4 cup whole milk in a microwave safe dish (I use a glass measuring cup) until almost boiling. Place the white chocolate chips into a heat safe bowl and pour the hot milk over them and whisk until smooth. 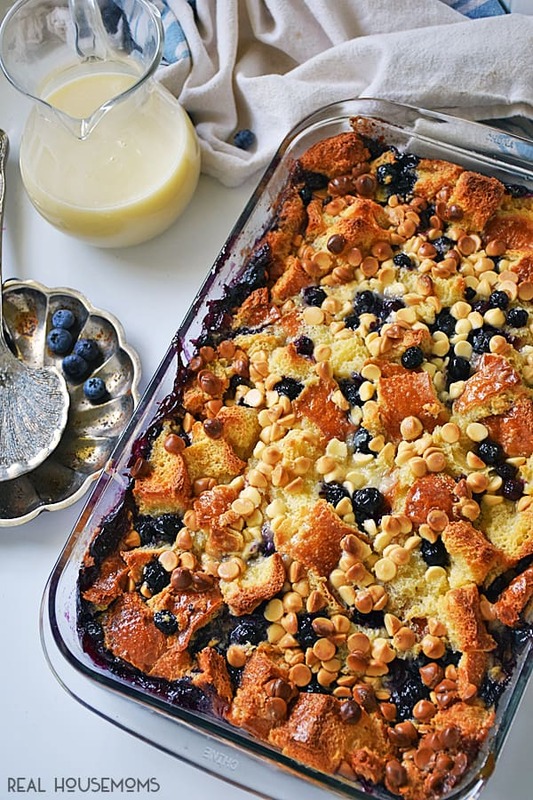 Serve with warm Blueberry Bread Pudding and enjoy! 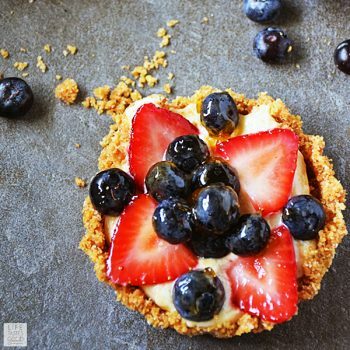 Another easy blueberry recipe you’ll want to try before the season is over is my Red, White, & Blue Fruit Tart. Delicious and easy too!